Right from the start, the Philadelphia Eagles dominated. With Michael Vick returning and DeSean Jackson, the Eagles looked to be good to go versus the Indianapolis Colts. And they did. On the first play, LeSean McCoy opened up for a 62-yard rush. Then a couple of plays later, Vick found Jackson open for a nine-yard touchdown. As a Colts fan, I was frustrated. But if you don’t know me all that much, I must admit that I have also been an Eagles fan, but I adore Indianapolis more. However, I couldn’t believe how bad Indy did. In their retro uniforms, the Colts hoped to go 6-2 and take advantage of the AFC South division. They couldn’t. The Eagles were too good for Indy. Peyton Manning opened up the starting drive with incomplete passes. He then threw a pass under pressure which would end up in cornerback Asante Samuel’s hands as he took it back to the ten-yard line. The Eagles would be in the red zone for their next two or three drives and make field goals, going as far as towards a 16-7 lead. However, Indy came back as Peyton Manning drove down the field with some helpful runs with Donald Brown. There, Manning found Jacob Tamme open for a screen pass. Tamme got it and dived for the end zone to get the Colts back into the game within a 13-7 deficit. The Colts big problem was penalties as they were struck by them multiple times in the game. With that, it was a big game-changer. Without all the costly, dumb penalties, the Colts could have taken this game away. But they couldn’t. After several defensive stops, Manning came back again. At midfield, Manning tried to hook up to Austin Collie, who got hit extremely hard. It would go down as unnecessary roughness. Sometime this week, I will write an article about helmet-to-helmet hits which was inspired from this deadly hit. Collie was frozen after the hit and was placed on a stretcher. Manning would keep the drive going, eventually handing it off to Javarris James for a score to cut the lead 16-14. After a defensive stop, Manning led the Colts down the field to set up a field goal by Adam Vinatieri to have Indy’s first lead of the game, 17-16, at the end of the first half. The Eagles would stomp right back in the second half, kicking a field goal to gain their lead back, 19-17. Then they would hook up on another touchdown to bring up the lead 26-17. The drive was mainly helped by Vick, who made a 30-plus-yard scramble on a crucial third down. The Colts would come back, as Manning gave James the ball again for another touchdown. James looking like his cousin, Edgerrin, who was a star back in the Colts powerhouse offense less than a decade ago. The deficit was just two points for the Colts, 26-24. After a defensive stop and with 40 seconds to go, this was the last chance for Indianapolis. But it was over when Manning threw another interception, which fell in Samuel’s hands once again to end the game. Right now it could be anyone’s way. However, I think the Colts can ice Jacksonville at home. They have two games with the Titans. I think the Colts will finish somewhere around 11-5 to 13-3. The Colts shouldn’t worry a whole lot currently. This was a must-win for Philadelphia, however, and now they just trail the Giants in the NFC East by one game. Manning was not at his best at all in this game, going 31-of-52 for 294 yards with one touchdown and two interceptions, ending up with a 65.7 rating. 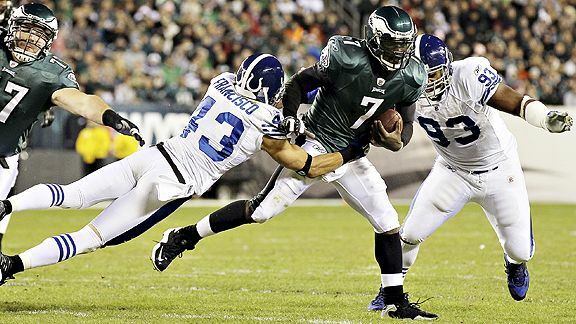 Michael Vick dazzled, however, with 19-of-27 passes completed for 218 yards with a touchdown for a 93.8 rating. He also had ten carries for 74 yards and a touchdown. Donald Brown had 15 carries for 50 yards while James had four carries on twelve yards with two touchdowns. LeSean McCoy had 16 carries for 95 yards. Tamme had eleven catches for 108 yards and a touchdown while Reggie Wayne had eleven catches for 83 yards for the Colts. Jackson had seven catches for 109 yards and a touchdown for the Eagles. Jeremy Maclin had four catches for 48 yards. The Colts haven’t been so well on the road, as they are currently 2-3 there. 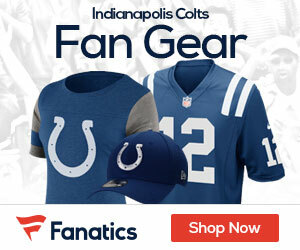 They will be hosting the struggling Cincinnati Bengals next week, as Indianapolis is 3-0 at home. The Eagles will meanwhile travel to Washington to face the Redskins. Come on Colts. Shake this game off. Get ready for Bengals next week.